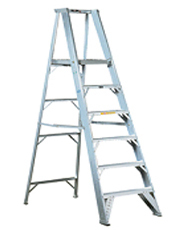 We are leading aluminium ladders manufacturer company in Chennai. 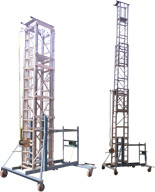 Sendhamarai Engineering offering wide varieties of aluminium ladders like Industrial Aluminium ladders, Tiltable mobile tower extension aluminium ladder, Wall support aluminium ladder, Wall support extension aluminium ladder, Self support aluminium ladder, Self support extension aluminium ladder with movable, Trolley step aluminium ladder, Tiltable tower aluminium ladder. We good negotiable price for our entire customer for both Rental & Purchase. We services that meet our customer's specific requirement. 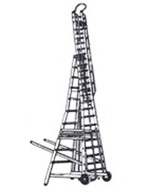 We are the leading manufacturer and supplier of Aluminum Tiltable Telescopic Aluminium Ladder. Aluminum Tiltable Tower Ladder mounted on M.S. frame of angle and channel of suitable size. 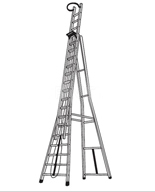 As a reputed organization, we are indulged in offering Aluminum Tower Ladder. These products are highly acknowledged for their durability and longer functional life. These tiltable ladders are used where the conventional ladders cannot be used. Highly efficient and very economical these tiltable aluminium ladders are the perfect to your needs. We provide you these ladders in diverse sizes (upto 60' FEET). 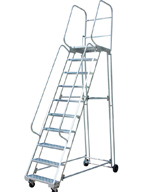 Our Aluminium Ladder are wall supporting ladders can be easily carried and stored. All Aluminium Ladders are manufactured from our own factory in Chennai. The ends of wall aluminium ladders stiles are fitted with rubber plugs to avoid accidents. We can custom design these wall ladders as per our client's requirements. We supply variety of wall supporting aluminium ladders, wall ladders, fixed wall ladders, wall mounted ladders, sliding down wall ladder, Extension Aluminium Ladder, Wall type extension aluminium ladder etc. Our self supporting aluminium ladders are widely used in maintenance areas. They are strong and designed to function perfectly in different industrial environmental conditions. These self supporting aluminium ladders manufactured by us fulfill with the international norms of safety & quality. 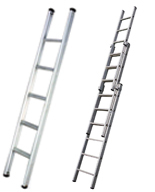 Our wide range of step aluminium ladders include self supporting aluminium ladders, aluminum step ladders, extension aluminium ladders, folding aluminium ladders, safety ladder, multipurpose aluminium ladders etc. We are a manufacturer of Self support extendable ladder with movable in Chennai, TamilNadu and supplying our products to all over India. These extension aluminum ladders are manufactured from hollow seamless extrusions having corners radiuses for strength. The crossbars are fitted well to synchronize with other heights of trestles and to keep performance plank level. The ends of aluminum extension ladders stiles fitted with rubber plugs and even some are available with rolling wheels & breaks. Further, they are also designed with extension facility.We manufacture and supply a wide range of all types of aluminium ladder with marketable prices.